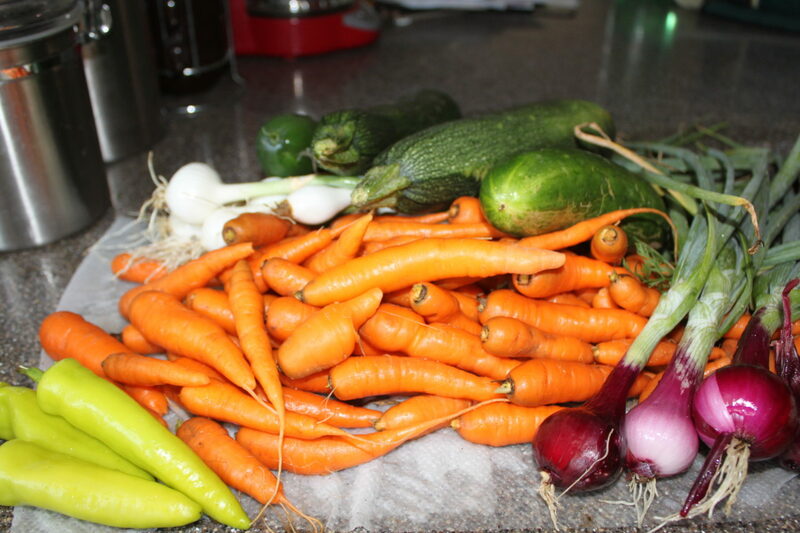 This past weekend I was so excited to start to pick the first round of our summer crop of vegetables. I picked a few cucumbers, small onions, zucchini, peppers, and carrots. I was very surprised at the amount of carrots that were poking up through the soil, begging to be picked. Because I was in the zone of pulling weeds and digging out the veggies, I didn’t notice that my basket was full of so many carrots that even Peter Rabbit would have been stuffed. So as I was at the kitchen sink cleaning the crops, I began thinking of what I could make to use up all of the carrots. Of course, feeding them to our family as a nice crisp snack as we watched baseball games was my first thought. (You can only eat so much ballpark food, and honestly, by June, I don’t want to even step foot near a concession stand). So as I packed the orange treats in small snack bags, I realized that we barely made a dent in the supply. The boys will snack on them when Ranch dip is available, but I knew we would need to get creative to ensure that we would not to waste the remaining supply. It has been extremely hot in Ohio, and the thought of putting the carrots in a crock pot with a roast all day, honestly just doesn’t sound appealing right now. I had to think of something fun and cool to make in order to use the rest of the first picking crop. Of course, with future crops, we will be sharing our treasures with family, friends, and the community, but these are first picking carrots –which are not so pretty, if you know what I mean. So….last night, as I got my nightly sweet tooth, it came to me! 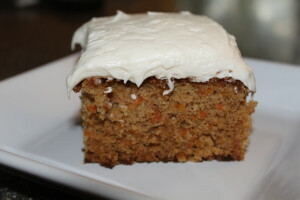 Homemade Carrot Cake! This isn’t a family recipe passed on from generation to generation……YET! I did some research on the internet and added a few changes to this basic recipe, and by the end of the night, it was GONE! Yes, a success I would say. Preheat oven to 350 degrees F (175 degrees C). Grease and flour a 9×13 inch pan. In a large bowl, beat together eggs, oil, sugar and vanilla. Mix in flour, baking soda, baking powder, salt and cinnamon. 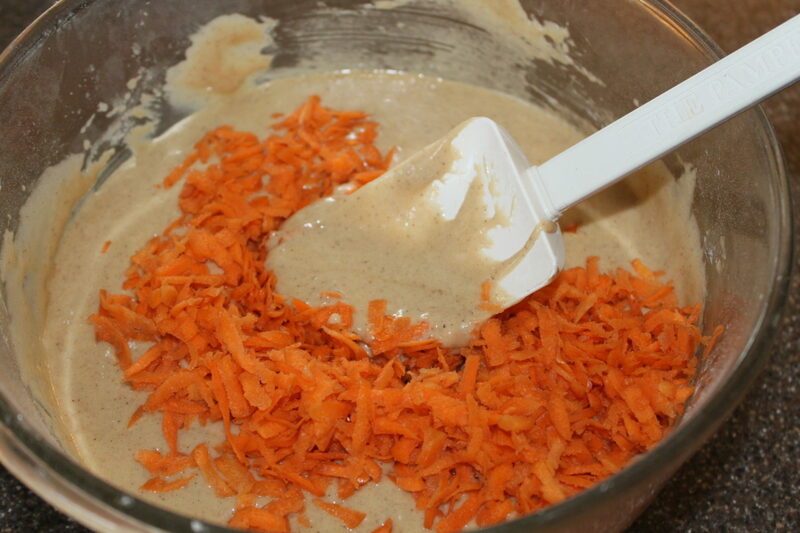 Stir in carrots. Folding in the shredded carrots – Hint – use the coarse grater not the fine grater to make the moisture content perfect! Pour into prepared pan. Bake in the preheated oven for 40 to 50 minutes, or until a toothpick inserted into the center of the cake comes out clean. Let cool in pan for 10 minutes, then turn out onto a wire rack and cool completely. To Make Frosting: In a medium bowl, combine butter, cream cheese, confectioners’ sugar and vanilla. Beat until the mixture is smooth and creamy. Frost the cooled cake. 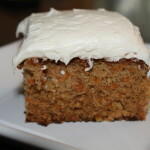 The Final Product – Moist and Delicious Carrot Cake! In a large bowl, beat together eggs, oil, sugar and vanilla. Mix in flour, baking soda, baking powder, salt and cinnamon. Stir in carrots. In a medium bowl, combine butter, cream cheese, confectioners' sugar and vanilla.